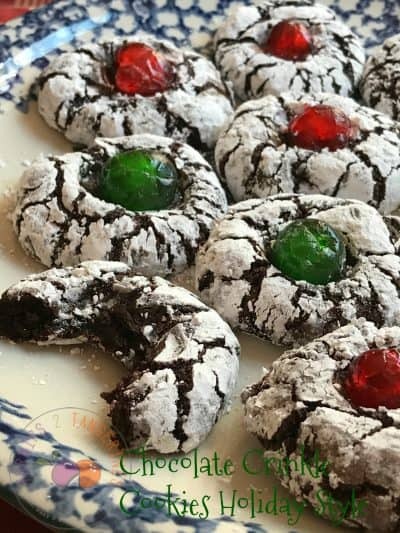 Chocolate Crinkle Cookies Holiday Style are chocolaty, powdered sugary, sweet and delicious. 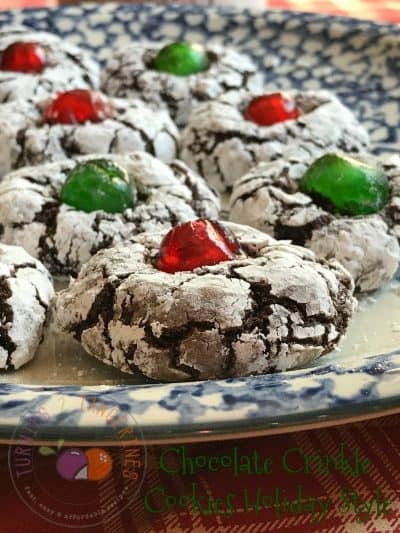 Red and Green candied cherries top each powdered sugar covered cookie, making them the perfect addition to your holiday cookie tray. 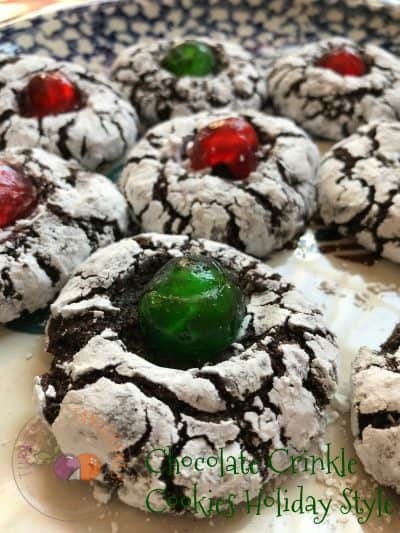 Chocolate crinkle cookies remind me of a chocolate fudge brownie that has powdered sugar sprinkled on the top. The kind of brownies my mom used to make many, many eons ago. 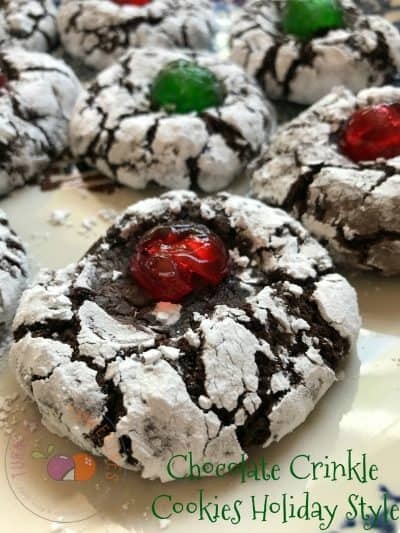 Chocolate crinkle cookies made with all red candies cherries would be great to serve for Valentine’s Day and making these festive cookies with all green candied cherries would be super cool for St. Patrick’s Day. Now that the holidays are fast approaching, it’s time to stock up on baking supplies such as flour, sugar, baking powder, spices and something I always forget to buy..cream of tarter. Can’t make sugar cookies without it! Everyday is a good day to bake cookies in my book! Especially if they’re chocolate cookies. One of my favorite ‘desserts’ is a handful of cookies. I’ve never tried a cookie that I didn’t like and personally, I don’t think cookies receive that special spotlight that they deserve. Just think about it, there are packaged cookies, homemade cookies, slice’n bake cookies, gourmet cookies, specialty cookies, holiday cookies and don’t forget, Girl Scout Cookies! A cookie can be any of the various hand-held, flour-based sweet cakes, either crisp or soft. The word cookie comes from the Dutch koekje, meaning “little cake.” The earliest cookie-style cakes are thought to date back to 7th-century Persia, one of the first countries to cultivate sugar. There are six basic cookie styles, any of which can range from tender-crisp to soft. Drop, Bar, Molded, Pressed, Refrigerator, and Rolled. A drop cookie is made by dropping spoonfuls of dough onto a baking sheet. Bar cookies are created when a batter or soft dough is spooned into a shallow pan, baked, cooled and cut into bars. Hand-formed or Molded cookies are made by shaping dough by hand into small balls, logs, crescents and other shapes. Pressed cookies are formed by pressing dough through a cookie press to form fancy shapes and designs. Refrigerator or Ice-Box cookies are made by shaping the dough into a log, which is refrigerated until firm, then sliced and baked. Rolled cookies begin by using a rolling pin to roll the dough out flat; then it’s cut into decorative shapes with cookie cutters. Other cookies, such as the German Springerle, are formed by imprinting designs on the dough, either by rolling a special decoratively carved rolling pin over it or by pressing the dough into a carved cookie mold. In England, cookies are called biscuits, in Spain they’re galletas, Germans call them keks, in Italy they’re biscotti and so on. Cookie Cutter- a metal or plastic device used to cut decorative shapes out of dough that has been rolled flat. Cookie Mold- most often made of wood, these decorative molds are used to create designs in some European cookies. Cookie Press- this tool consists of a hollow tube fitted at one end with a decorative template or nozzle and at the other end, a plunger. Cookie Stamp- a small, decorative, round or square cookie imprinter, usually made of glass, ceramic or wood. What holiday cookie traditions do you have in your house? Our favorites are cut-out sugar cookies, peanut butter blossom cookies and thumbprint cookies. 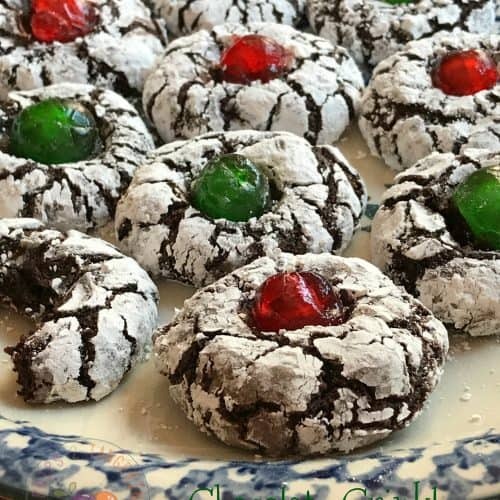 The candied cherries used in this recipe are from Paradise Fruit Co.
Chocolate Crinkle Cookies Holiday Style are the perfect cookie to put on your holiday cookie tray. Keyword: Christmas, cookies, Paradise Fruit Co. In a large bowl, combine the cocoa powder, white sugar and vegetable oil. Mix with electric mixer on medium speed for 2 minutes. Add the eggs and vanilla extract and mix until evenly combined. Combine the flour, baking powder and salt in a small bowl. Add all the ingredients to the chocolate mixture and combine until blended. Cover the dough and refrigerate for at least 3 hours. Preheat oven to 350 degrees. Line a baking sheet with parchment paper. Measure out a small ball of dough using a small cookie scoop or about one tablespoon. Roll the dough into balls. 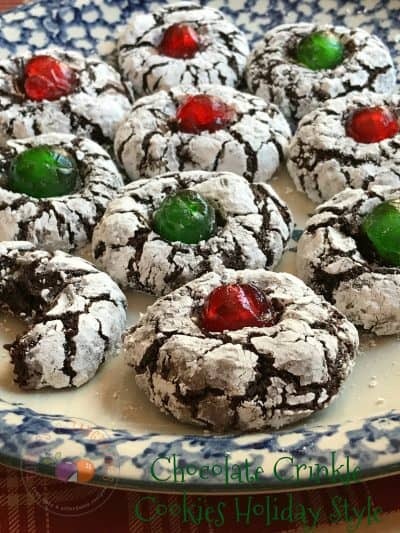 Coat each ball in powdered sugar, place onto prepared baking sheet and lightly press one half candied cherry into each cookie. Bake for 12 minutes. Transfer cookies to a cooling rack to finish cooling. Makes about 3 dozen cookies. Snickerdoodle Cookies and Cherry Winks A Classic Cookie are two cookie recipes you don’t want to miss.